Rachel and Josh are in middle school. They've been friends since second grade and do everything together. Meanwhile, Rachel has had a secret longstanding crush on Josh and she's afraid to tell him. He's gay but is closeted to his friends and family. Add to the mix a particularly unsavory fellow at school known as The Viper, who blogs about his classmates in the most unkind way possible. Everyone despises him, but of course they all read the blog the moment it is updated. The Viper finds out about Josh's secret, and the world (as Rachel and Josh know it) ends. This is the plot of the new rock musical Out Of My Comfort Zone, which deftly explores issues of self-identity, gender, stereotypes, cyber-bullying, love, and friendship. 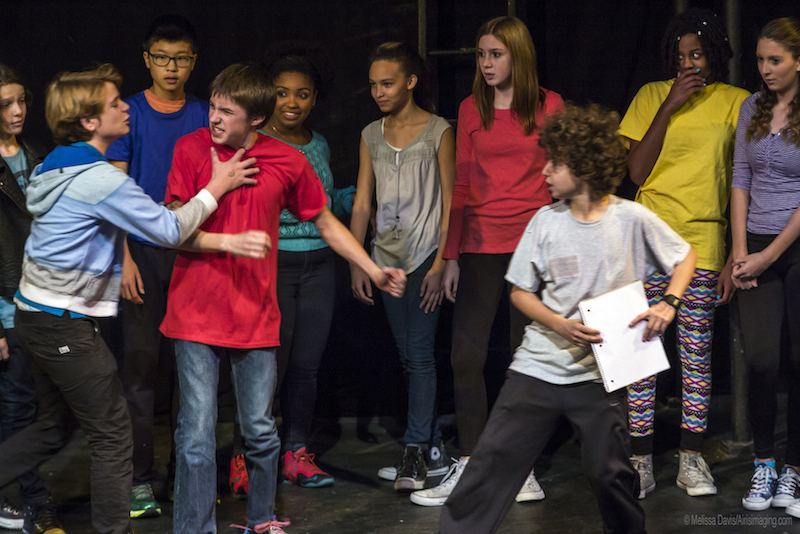 A recent sold-out run of the production was presented by the Children's Acting Company at the American Theatre of Actors in New York City. Two revolving casts of fifteen featured a total of twenty-two young and gifted performers ranging in age from twelve to fourteen years of age. The musical was written by husband and wife team Ivy Vale (book, lyrics, and music) and Rick Reil (music), directed by Vale with Mimi Stuart, and produced by Mimi Stuart and Jason Grant. Musical director Rick Reil is an accomplished singer, songwriter, multi-instrumentalist, producer, recording engineer, and long-time member of psychedelic pop-rock band The Grip Weeds. Writer and Co-Director Ivy Vale is a musician, artist, writer, and playwright. She is a singer/songwriter and founding member of psychedelic folk band The Wyld Olde Souls. "We were driven to write Out of My Comfort Zone as a way of making a strong statement against bullying, specifically bullying that targets any child or teen who may be perceived as gay or identify as LGBT," said Vale. "There is a clear need for reality-based material for young teens who want to see shows that reflect their own lives and deliver characters they can relate to. The songs, influenced by everything from The Who's Tommy to '60's girl groups to The Beastie Boys, really resonate with our twelve to fourteen year old cast." Being thirteen is no doubt as fraught with angst as it ever was but the added pressure of having a social media presence on the internet can literally break a fragile soul. Especially when that soul is in the closet, or is being bullied, or has a deep dark secret they're just not ready to reveal. I spoke to the cast at rehearsals last month and marveled as the production evolved before my eyes into a singing, dancing powerhouse punctuated by dialogue that rings true and real. I asked 13-year-old Violet Vale (Reil and Vale's daughter), who plays Rachel in one of the two casts, about how her school deals with gay people. "I go to a really accepting school. We have assemblies twice a year about gay rights," she said. "Teachers talk about themselves being gay or people they know being gay. We have a day of silence for people who have been bullied and or people who are gay. I feel like I've grown up in such an accepting environment since I was in kindergarten so for me it's normal. It's nothing different than being straight." Lily Santangelo, age 13, added, "I really don't understand how people have the need to make other people unhappy. If they're happy with somebody and they love them, there should be no reason to break them down. You should just let them be themselves and accept them. Because they're not going to change for someone else; if they like the way they are, then they shouldn't have to change." Ages twelve and thirteen are difficult enough times to live through but to have to also have the added stress of being bullied for your very identity can ruin lives forever. Not to mention that any little thing that sets a person apart at that age opens them up for merciless teasing by their peers. Will Ehren, currently a ninth grader, plays Rachel's closeted best friend Josh. He told me, "Josh's character speaks to the bravery of being yourself and allowing that to be okay." I asked Will about how The Viper uses the power of secrets to wound others, using the wide reach of social media. "That's the worst feeling, relating that to my life. Especially with social media, today that's a big problem with people posting pictures that people don't like, posting them to the whole world and they can never truly be deleted. That's just a terrible to know that someone knows something that you don't want anybody to know and they can do anything with you." Michael Flynn, who plays The Viper, revealed, "The Viper had a horrible past in his old school so he comes to this new school and says, I don't want to be bullied again. I want to show that I can be in charge, that nothing will scare me, so I have to hurt others. Even though I may want to be their best friend I need to hurt them so I feel better about myself." Many of the cast members echoed past experiences of being bullied or bullying; one young cast member even admitted that things got so bad for her she was changing schools. The performers included Will Ehren, Violet Vale, Savannah Leroy, Michael Flynn, Reuben Levine, Elliot Lipman, Kailie Strutin, Lily Santangelo, Zoey Mae Dillon-Levine, Ruby Karp, Wiley Kimelman, Kiara Coleman, Mikayla Rose, Irena Kogarova, Claire Stein, Ness Krell, Michael Ning, Jerrell Jones, Alana Deller, Kirah Murray, Jasmine Mateo, and Helena Milburn. The audiences, sold out for each performance, were an interesting mix of kids the same age as the performers, some even younger and some older, as well as parents, grandparents, and theater-goers who love a realistic story. The songs are completely infectious and fun ranging in genre from rock and roll to hip hop. At intermission the live band led by Reil played a reprise and I heard several people already singing along to them after just hearing them once. The play itself moves at a brisk pace that matches the lives of teenagers today. There was plenty of humor in the dialogue that effectively balanced the serious subjects tackled by the script. The humor in the song lyrics is brilliant, ranging from a plaintive lament from Daisy, the one girl in school who has allergies to just about everything one can be allergic to ("Don't yuck my yum or tell me that it's dumb because I'm lactose intolerant / you could really be more tolerant / I'm not from another planet / Do you think I would have asked for this / Do you think I would have planned it") to the glam kid Connor performing his manifesto "Heavy Metal First Kiss" at the talent contest ("she's my evil princess / heavy metal first kiss / she's my evil princess / now we're touching faces / lip gloss on her braces"). The dialogue sparkles as brightly as the song lyrics. Francis, an adorable science geek, is angling for First Prize as America's Top Junior Scientist and follows his classmates around with a pad of paper and pen. He addresses his friend Lee, who has just admitted that he made out with a girl at camp last summer for five minutes. "Whoa, whoa, whoa. You made out? I'm wondering if you can answer a few questions for me in the interest of scientific research, like what first attracted you to this fair maiden? Would you describe her as hot? Feel free to go into detail. My honors math class doesn't start for another ten minutes so I've got nothing but time." "So let me get this straight. You're going to spy on people and write about it," responds Lee. "When I win America's Top Junior Scientist Award and the thousand dollar prize, the babes will be lining up for a piece of this," he brags, pointing to himself. "Chicks love a guy in a lab coat. I'll be doing hands-on research" (leering as only a twelve-year-old boy can, he squeezes two imaginary breasts). "That's gold, my friend." The heart of the story is Rachel and Josh's friendship and how conflicted they both are about it. She wants to move into a new stage of the relationship - he wants to finally be honest and tell his best friend that he's gay. At one point, as the conflict escalates, Rachel sings to Josh: "I lost my mitten in the snow, you held out your hand / You played the drum, I played the flute, we both quit band / We always share the popcorn, we've even shared a straw / We star in the same movie but it's got one tiny flaw / I don't wanna be just friends...I don't wanna be just friends / it was fine for a while, now it's infantile / I don't wanna be just friends." Vale and Reil have high hopes that the production will be renewed for another run in the New York City area. Vale recently told GLAAD that she hopes Out Of My Comfort Zone can be produced for schools throughout the country as an educational tool. "We're hoping to help some kids who are maybe conflicted about whether or not it's right for them to come out." For more about Out Of My Comfort Zone visit their Facebook page. More on The Children's Acting Company can be found here.